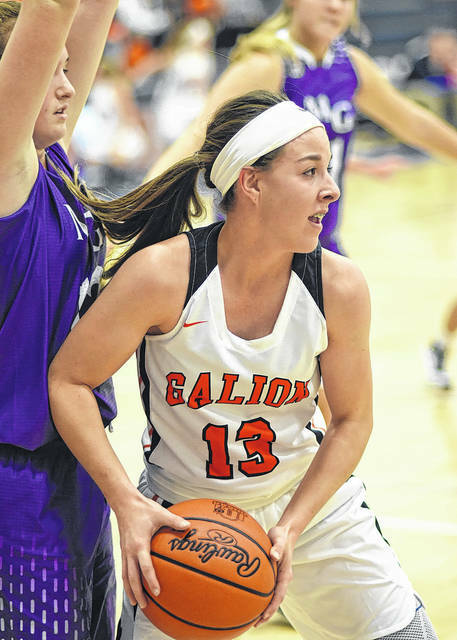 GALION — For the first time in many seasons, Galion’s girls basketball team is 2-0 after beating Crestline and Mount Gilead in their first two games. Last Friday, the visiting Tigers opened their campaign with a 38-30 victory over Crestline. The first eight minutes of the season went two minutes and 15 seconds before any scoring. That drought was ended by Galion’s Gabby Kaple, who hit her first shot attempt with 5:45 remaining to put the Lady Tigers up 2-0. Both teams continued to search for their respective strides throughout the opening quarter and when the clock hit zero, it was the visiting Tigers taking an 8-4 advantage into the second. In that second quarter, the teams would mirror their outputs from the opener and Galion would head into the locker room at the half, up by a score of 16-8. With the opening half of the season in the books, both teams took to the court for the third quarter and it would be the Lady Tigers that would continue to open up their lead and would head into the final eight minutes up 27-17. Crestline would not surrender however and would continue to keep the game close. The final quarter saw a lot of back and forth play which proved to give the home team some much needed momentum. The Lady ‘Dogs would claw their way back but the visiting Tigers would grit out the fourth and hold off the Crestline squad for their opening night victory; 38-30. Kaple led all Galion scorers with 20 points to go along with nine rebounds, an assist and two steals. Julie Clouse added nine points, three boards, an assist and a steal for the Lady Tigers in the win. Morgan Kimble scored four points and grabbed five rebounds for the visitors while Gracie Groves put up a thorough stat line consisting of three points, seven rebounds and an assist on offense and also recorded a block and a steal on defense. Other Lady Tigers stats on Friday were: Teresa House, apparent defensive specialist- 1 point, 2 rebounds, 1 assist and Kelsey Hoffman- 1 point, 1 block and 2 steals. Team: 2-point field goals- 9/20 (45%); 3-point field goals- 2/11; total field goals- 11/31; free throws- 14/25; 6 offensive rebounds, 18 defensive rebouns, 1 block, 5 assists, 6 steals and 29 turnovers. Crestline was led by the Tadda sisters, Lydia and Lauryn, as well as Alandra Tesso on Friday. All three ladies finished the contest with six points apiece. Lauryn rounded out her stat line with nine rebounds, two assists and five steals. Lydia grabbed five boards, dished two assists and recorded two steals. Tesso scored all six points from beyond the arc while also pulling in three rebounds, dishing two assists and earned a steal on defense. Other Lady Bulldogs statistics on Friday were: Bri Briggs- 4 points, 3 rebounds; Hannah Delong- 3 points; Destiny Hoskinson- 2 points, 1 block, 2 steals; Daija Sewell- 2 points, 3 rebounds and Kennedy Moore- 1 point, 5 rebounds, 1 block, 2 assists and 4 steals. Team: 2-point field goals- 5/23; 3-point field goals- 4/21; total field goals- 9/44; free throws- 8/16; 12 offensive rebounds, 16 defensive rebounds, 2 blocks, 8 assists, 14 steals and 23 turnovers. On that evening, the Bulldogs on the evening that Crestline announced the name of their new, live bulldog mascot. The bulldog, a male, had his name voted on and the final decision was made to name him Spike McHutson Hill. On Monday night, Galion picked up win No. 2 when they beat Mount Gilead 50-44. No statistics were available for that game. Up next for Galion will be their Mid-Ohio Athletic Conference opener at Pleasant on Thursday. GALION — After their win on Friday night at Colonel Crawford, the Northmor girls basketball squad welcomed the ladies from Bucyrus to their home floor on Saturday. Despite 11 points from Addie Farley, the Lady Knights offense could not get it going against Bucyrus and would drop the contest; 51-29. Northmor dropped to 1-1 on the season with the loss and Bucyrus begins their 2017-2018 campaign at 1-0. Next up for the Lady Golden Knights will be their first Knox-Morrow Athletic Conference clash of the season. On Wednesday, November 29, Northmor will host the visiting Fredericktown Lady Freddies. NORTH ROBINSON — The high school girls basketball season kicked off last Friday, November 24 for two area teams as the Northmor Lady Golden Knights traveled to Mac Morrison Gymnasium to meet up with the hosting Colonel Crawford Lady Eagles. Addie Farley would drop in 15 points while teammate Cristianna Boggs contributed 12 points to help the Knights to a season-opening win. NORTH ROBINSON — No results were submitted for this contest. GALION — On Wednesday, Nov. 22, the Galion girls bowling team capped off a three-day match streak with a victory over Crestline. Marissa Snyder had the high game and series for Galion again, rolling a 199 game and a series of 343. With the victory, the Lady Tigers improved to 2-1 overall and are 0-1 in the Mid-Ohio Athletic Conference. Boys score: Galion- 2,207 and Crestline- 1,828; Galion is 3-0 overall and 1-0 in the MOAC. After competing against River Valley at Blue Fusion on Nov. 27 and at home against Shelby on Nov. 28, Galion will be off for a week before welcoming Gilead Christian to Victory Lanes on Tuesday, Dec. 5. GALION — On Nov. 21, the Galion Lady Tigers bowling squad welcomed the Ridgedale Lady Rockets to Victory Lanes in Galion for a non-conference match up. After dropping their first match of the season, Galion bounced back and defeated Ridgedale; 1,549-1,351. The Lady Tigers moved to 1-1 in the early 2017-2018 season behind Snyder, who had the high game (180) and series (308). Boys score: Galion- 2,160 and Ridgedale- 1,821. MARION — To open the regular season, the Galion Lady Tigers bowling squad traveled to Blue Fusion in Marion to clash with the Pleasant Lady Spartans in MOAC competition. Pleasant won 1,691-1,534. Top bowler on the day was Snyder, rolling a 182 high game and a 352 high series. Boys score: Galion- 2,069 and Pleasant- 1,935. GALION — On Nov. 27, the Northmor bowling squads opened their regular season at their home alley against Gilead Christian. The Lady Knights came away victorious by a final of 1,445-1,212 over the Lady Eagles while the boys struggled and fell; 1,250-1,088. Alexis Yarnell led the way for Northmor, notching the high game of the night in her first ten frames at 192. Yarnell also picked up a 131 in game two to land the high series at 323. Chloe Meier rolled a 167 and a 141 to also record a 300+ series (308). Other Northmor scores for the girls were: Samantha Grogg- 188; Sara Drumm- 138; Maddie Hoverland- 112; Christin Eichler- 77 and Tory Carver- 66. Game one saw the squad bowling a team total of 676 while game two was a 536. The Lady Knights rolled a 108 and a 125 in the two baker games. Sarah Dudley and Josh Langoehr had two identical games on Monday, rolling an 89 and 104 (high game) to tie for the high series mark of 193. Other Northmor scores for the boys were: Jared Hale- 103; Ricky Borders- 98; Zach Govoni- 94; Kylie Foot- 72; Joe Baldinger- 71 and Bob Guiler- 51; The boys recorded scores of 446 and 429 in games one and two, respectively. In the baker games, the Knights rolled a 109 and a 104. Northmor’s bowling teams return action Dec.. 2 when they clash with Highland. Gabby Kaple (13) looks to pass away from the Mount Gilead defense during girls basketball action Monday evening at Galion High School. The Lady Tigers won the non-conference clash; 55-40. 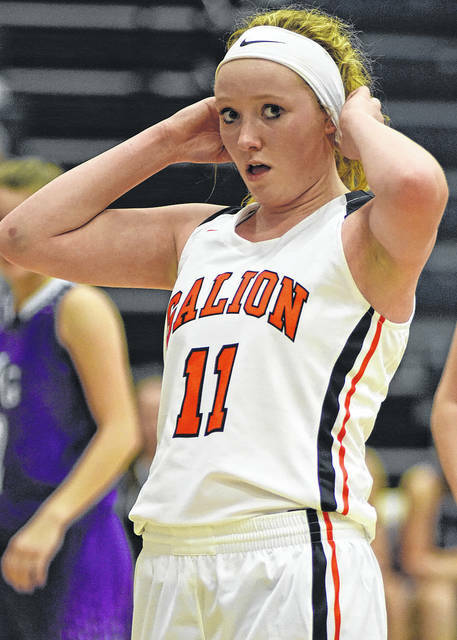 Galion’s Gracie Groves takes time to readjust during a break in the action on Monday night. Groves and the rest of the Galion Lady Tigers play host to and defeated the Mount Gilead Lady Indians to improve to 2-0 early in the season.